The Brown Squirrel Fingerless Paws come as pictured and are available in One Size Fits Most Adults. Let out your inner animal with these comfortable and versatile Paws! 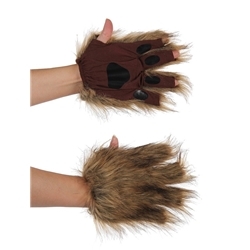 This type of glove works well for Squirrel Costumes, Mouse Costumes, Dog Costumes, and many other animals! If you’re looking to piece together an animal costume for a school play, a concert, a cosplay convention, or for Halloween, these are the mitts for you.